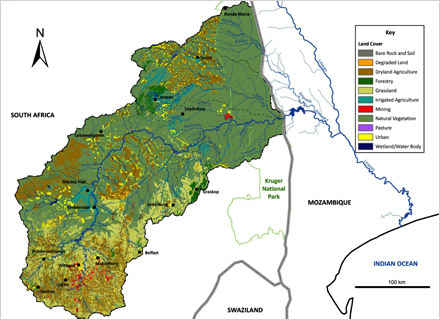 Map of the Upper and Lower Olifants River Catchment Management Area. Large-scale monitoring is underway to characterise water pollution in this intense mining and agricultural area, and a human health risk assessment project in the Upper Olifants was done in 2010. Results showed that risks from exposure to high pathogen concentrations and metal accumulation in vegetation were at higher levels than what is considered acceptable for consumption of food and water. View more information about the 2010 Upper Olifants Project. 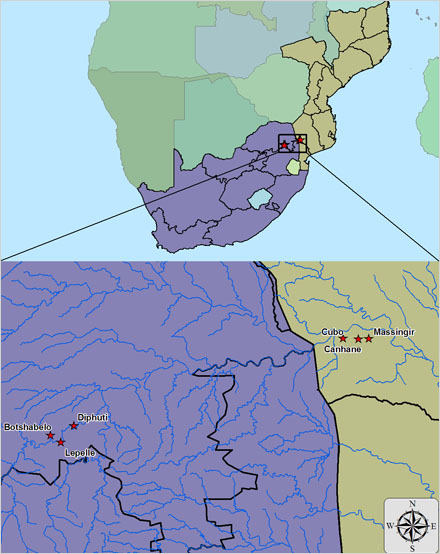 To determine the extent to which water and air pollution may have an impact on the health of two communities in the Lower Olifants River Water Catchment Area, with the purpose of identifying potential human health risks and relevant coping strategies that will inform and guide locally-appropriate, sustainable solutions. The project is led by the CSIR Climate Studies, Modelling and Environmental Health Research Group in collaboration with the NOVA Institute, South African National Parks (SANParks) and Eduardo Mondlane University. The CSIR environmental health team specialises in finding innovative and relevant solutions through collaborative partnerships in environmental health research in southern Africa. The CSIR Water, Ecosystems and Human Health Research Group specialises in understanding the systems of water use in terms of human well-being, ecosystem integrity and security of water supply for different uses in order to predict various possible results. The CSIR Water Governance Research Group specialises in research to ensure the equitable, efficient and sustainable deployment of water resources to support socio-economic development. NOVA aims to develop and promote ways (models, products, technologies, practices) to improve the quality of life of households. Nova executes its mission together with household residents and networks. Scientific Services exists to act as a hub of formal learning in the biophysical sciences, and of rigorous scholarly yet practical thinking, within SANParks. The Eduardo Mondlane University strives for integration and affirmation in the international scientific community and for being an agent and subject to change and transformation of society. A report will synthesise current knowledge on environmental pollution and human health in the Lower Olifants. Evidence of environmental pollution in all media will be collected using environmental monitoring. Samples will be assessed to calculate potential health risks depending on different personal exposure pathways. Community health, healthy behaviours and coping strategies (to protect against environmental pollution) will be determined. Decision-makers, community leaders and key role players will be involved throughout the study to collaboratively address raised issues, strengthen community assets and reduce health risks.